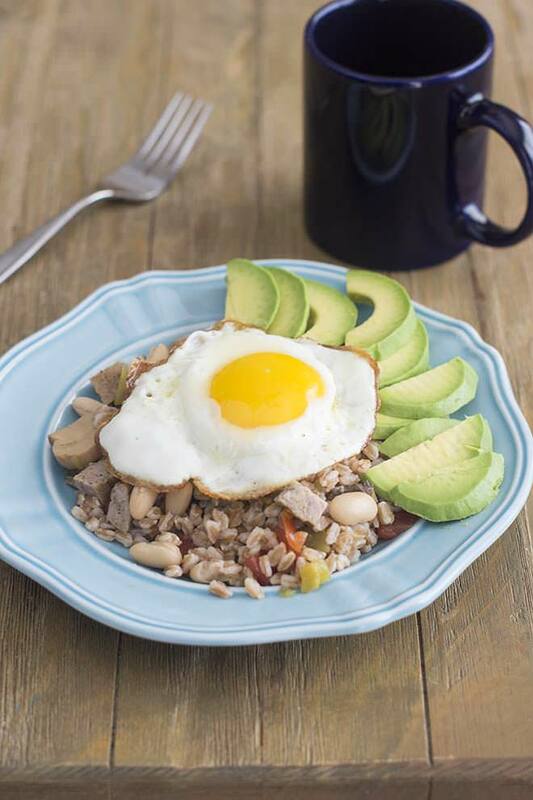 This protein-packed breakfast bowl mixture is made in a big batch so that you can freeze it and have a healthy breakfast at your fingertips every day. I have a difficult relationship with breakfast. Or weekday breakfasts, at least. I mean, on the weekend I happily head out to a diner or eclectic brunch place and feast on omelettes and bacon. During the week I’m at home in the morning and I don’t have my own omelette chef. Hmmm why is this? I should totally look into finding one! Seriously though, what I most lack on weekday mornings is time, but the usual quick breakfast options never appeal to me. Cereal, toast and smoothies just aren’t my thing. Mostly, they lack substance. I need a proper meal in the morning with a good hit of protein. Those breakfast standards don’t cut it for me. 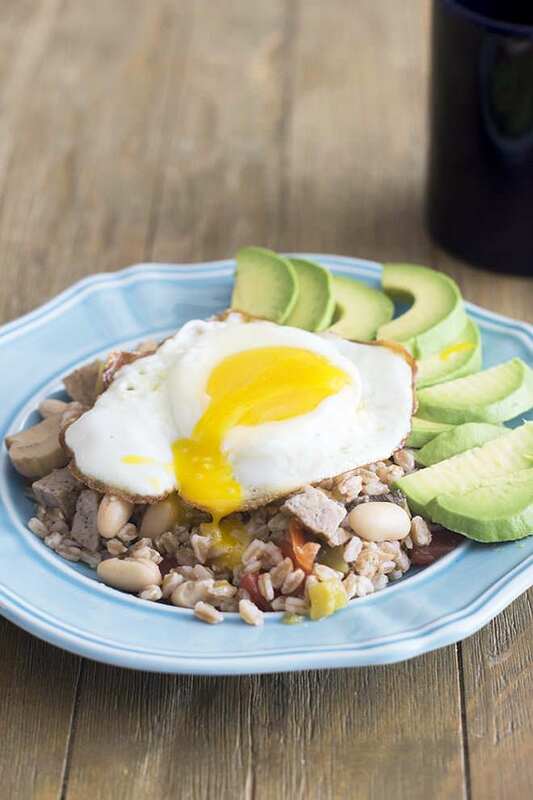 Enter the Farro and Sausage Protein Breakfast Bowl. Hello there, my dear sweet friend. 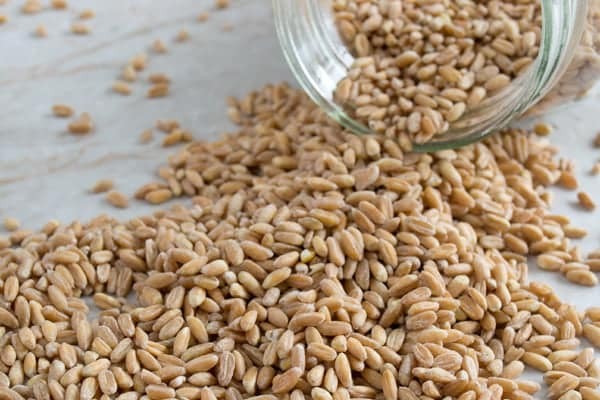 It has farro, which is a grain that I know you’ll love. This is the brand that I typically get. 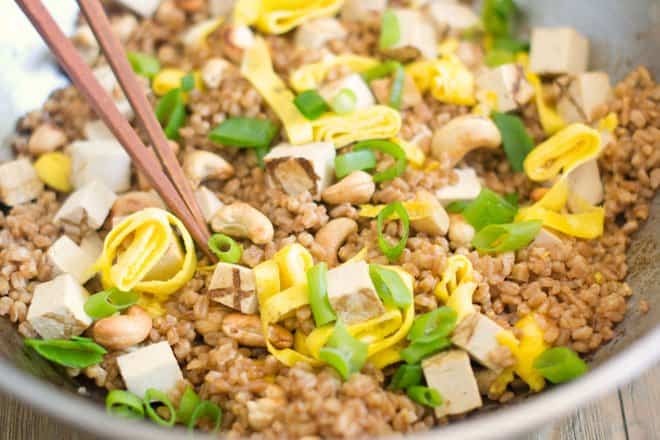 It cooks up quickly (here’s how to cook farro) and is packed with fiber and protein and also has good flavor and texture; it’s comforting like barley. Also in there is some chopped fully-cooked chicken sausage, tomatoes, mushrooms, beans and jalapenos. Here’s what I do. I make a big batch of this protein-filled mixture and then I put it into zip top bags in the freezer. I put two portions into each bag. Then I take a bag out in the evening and put it in the fridge. By morning it has defrosted and there I have breakfast for the next two days. If I’m in a hurry in the morning, I heat it up in the microwave and eat it as is. If I have more time, I heat it up and then top it with a fried egg or some scrambled egg whites. If there’s avocado in the house, you know some of that is going on there too. Green onions are another nice fresh addition. 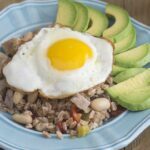 This protein breakfast mix is really easy to make. I go in with mostly canned things because that saves time. 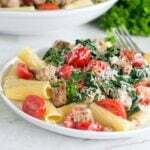 I cook up the farro and then put it into a big bowl and then I add the canned things, some seasoning and the all-important chopped fully-cooked chicken breakfast sausage. Mix it up and scoop it into bags. Done. 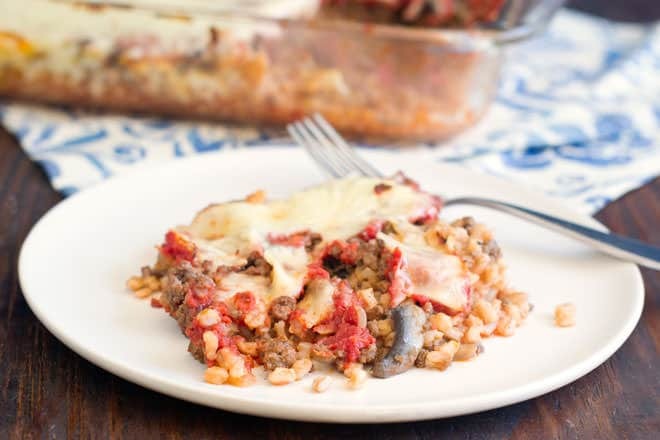 The mixture pictured above has the farro, a can of cannellini beans (white kidney beans), a can of diced tomatoes, a can of chopped green chilies and a can of chopped mushrooms. If all those canned ingredients offend you, no worries. Go ahead and saute an onion with some garlic, add the mushrooms and chopped fresh jalapenos. It an easy enough thing to do. Honestly though, I find that since it’s all going into the freezer where textures are going to soften up quite a bit anyhow, this is one of those cases where it’s not worth the effort. So that’s what’s in the above mixture. But I’ll tell you that I switch it up a lot. 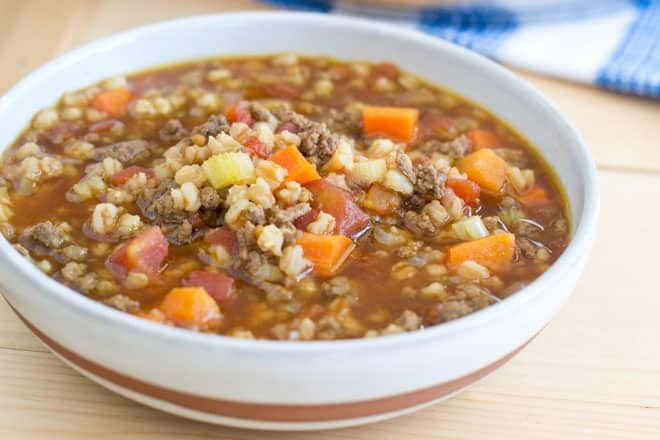 For instance, the version that I’m eating this week has the farro, chicken sausage, canned tomatoes and canned mushrooms but it doesn’t have the jalapenos. Instead I went with frozen chopped spinach (defrosted), a whole bunch of capers and Italian seasoning. It’s a completely different flavor profile so I don’t end up bored having it week after week, but it’s still healthy and satisfying every time. I swear, I wake up excited to face breakfast on weekdays now. No omelette chef required! 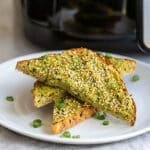 The brilliant thing about this recipe is that it’s ready in under 30 minutes and the result gives you a healthy, protein-packed breakfast for 8 days! Cook the farro like this or according to package instructions. Drain if needed. Transfer farro to a large bowl. Add the chicken sausage, beans, tomatoes, mushrooms, green chilies and salt. Stir. Scoop mixture into 4 ziptop bags. Each bag will contain two portions. Freeze bags flat. To serve, move a bag from freezer to fridge the night before. In the morning, transfer half of the bag to a plate or bowl and microwave for 1.5 minutes, or until hot. 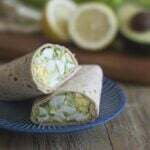 Eat as is or top with other items like cooked egg, avocado or green onions. Disclosure: This article contains an Amazon affiliate link meaning that if you click on it and buy something I get a teensy commission, at no extra cost to you. All opinions are honest and are my own.